The setting options available to an electric organ provide us with a proper sound effect but also a comfortable – smooth-playing. But someone has to make the adjustment. This usually requires money and nowadays not abound .. The operations described below require precision, care and relevant experience. But above all seriousness. 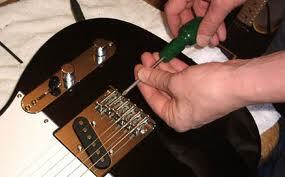 There’s always the case and do serious damage to the instrument, unless we are very careful and meticulous. Always use suitable and in good condition tools. Avoid large and abrupt load-forces and basically acquire patience. Otherwise, leave some experienced-as-we take responsibility. 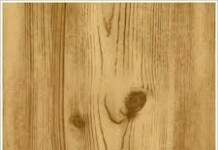 To arm of the guitar or bass is made of long, narrow woods which are significantly affected by environmental conditions -humidity & temperature- and because of the different stress load that it receives according to the thickness of the strings we choose -especially in the bass- creates the necessity of adjusting the curvature. 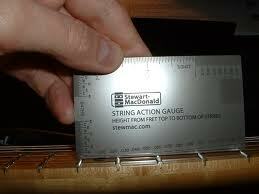 Please note that should be checked frequently, mainly after string changes with variation of their thickness. This setting is effected by means of a rod (truss rod) which is positioned inside the arm, usually from the vessel starts and ends in a screw head allen-type or vice versa, the screwing or unscrewing of which alter the curvature the arm. The rod may be made of steel, aluminum or carbon fiber. 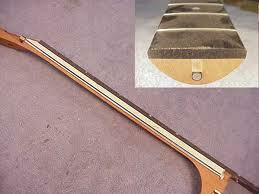 The screw truss rod will meet the head of the arm under a lid or as a hole or on the body under the pickguard. We identify the set screw truss rod. Carefully tune the instrument with a reliable & precise tuner. Control the curvature of the arm, looking with one eye, the body of the instrument to the keys, right on the edge of the fingerboard. Observe the gradient is created, ie whether it is concave or convex arm. Hold the first and last fret in Mi bass string and check the distance between fret and string at the 8th fret height. This distance should be from 0.25 to rock style to 0.33 mm for playing jazz or 0.010 to 0.013 of an inch respectively; suitable tool to check is the feeler. 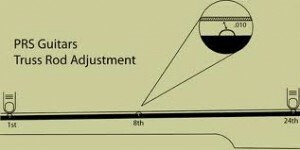 For a bass correct distance is 0.5 mm or 0.2 inch. 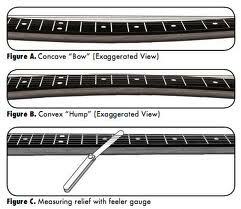 If the result is larger, resulting bad feeling, long distance string-fretboard-then you tighten the truss rod, ie turn the screw clockwise. Careful, gentle and incremental moves. 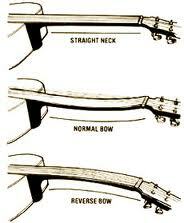 If less -squeaks, noize from the frets- then you loosen the truss rod, ie turn the screw left. Recheck by tuning again. The adjustment is always done with the instrument well tuned. Place the appropriate key -usually allen screw- in the truss rod -attention to it because it is easy to spoil the screw head, which is not always highquality- and slowly and steadily turn the screw in the desired direction. A rotation of a quarter of the cycle and may be sufficient. If the screw is difficult to turn and requires a lot of power, stop. Do not try, even though you did not achieve regulation, because it is very easy to break the rod, cut the head or even experience a rift in the arm. It is also good before tightening the truss rod for the first time, to relief a bit first. Once you did that for the first ever time, spend a few days and repeat. T his setting changes the distance between strings and frets, changing the distance, that significantly affects the way of feeling and the force needed, in order to play. When the aim is to ease, smoothness and accuracy for a fast playing, then the strings should be set low, so as not to appear noise by frets. When we want more dynamics, brighter and clearer sound for an intense play, then the strings should be set higher than the fretboard. Tune the instrument with a reliable & precise tuner. ed pointless to describe all! It isadvisable if you are unsure, please refer to manual. 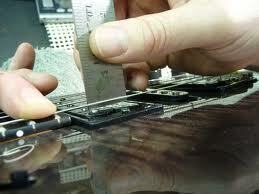 Repeat the process by tuning and checking all the frets for noise until you get the desired feel. 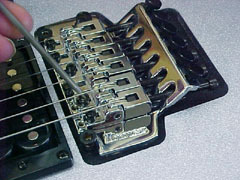 This arrangement varies the distance between the pickup and the strings. The change in distance significantly affects the timbre and volume of the instrument. The amount will be adjusted for each individual pickup by turning the screws properly –found its side. As we turn clockwise height decreases, while counterclockwise increases. Under the screws are springs or some type sponge rubber or synthetic material, which tends to push the magnet up. A pickup can be adjusted and tilted, for example if we want to achieve greater intensity for the thin strings vs the bass. Some manufacturers prduce pickups that have the ability of independent regulation of each pole in height, allowing a more complete balance of tension between the strings. This arrangement changes the chord length, moving forward or backward the barrels of the bridge. 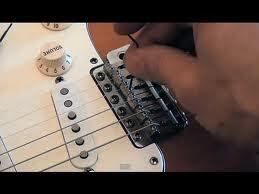 By setting these we correct the tuning of the instrument, in entire length of the fretboard. A body with bad intonation can be properly tuned to the fifth fret and the same note on the seventh fret is half or even a whole tone off. This setting must be done after finish setting the curvature of the arm and height strings with new strings and the help of a reliable tuner. Tune the instrument with a reliable tuner. Starting with the bass Mi chord playing an open and check that it is properly tuned. After clicking on the twelfth fret of the same string, check with the tuner if the note produced is correspondingly tuned. If you are under the accent, we should reduce the length of the string, with the appropriate screw behind the bridge, moving the barrel ahead. If exaggerated, we must increase the length of the chord unscrewing the corresponding screw behind the bridge, moving the barrel backwards. Repeat this operation for all strings, constantly checking with the tuner until you have the best possible matching between the open note and in this the twelfth fret. The ideal identity is something that can easily happen, especially in low-quality institutions, but we can bring the instrument to a satisfactory level. Repeating that there various types bridges that make even the arrangements of pairs of strings or that every manufacturer have been imagined! If you are unsure, refer to manual or contact us!